Since being in Korea I have seen many incredible things. 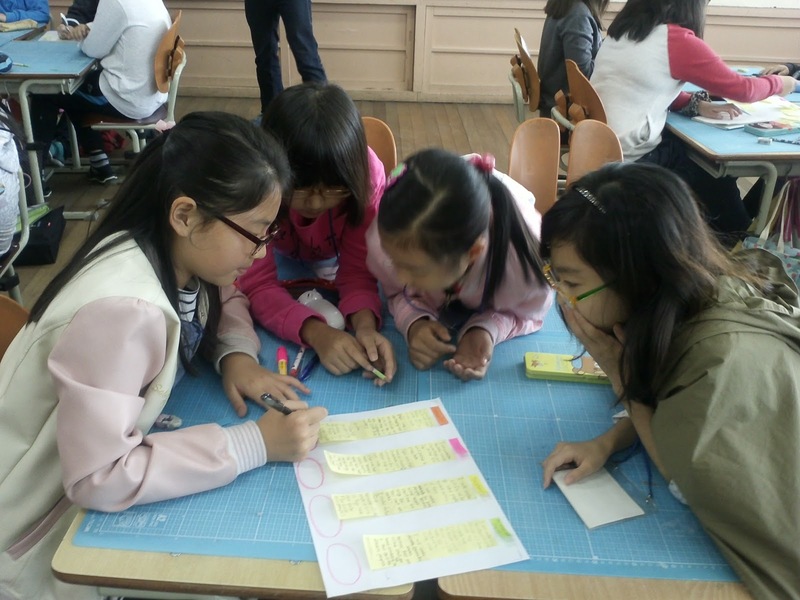 There are many aspects of the Korean education system that I think America would benefit from mimicking or adapting to fit into their society. Sadly one thing that seems to be a universal issue no matter what country you're in is bullying. 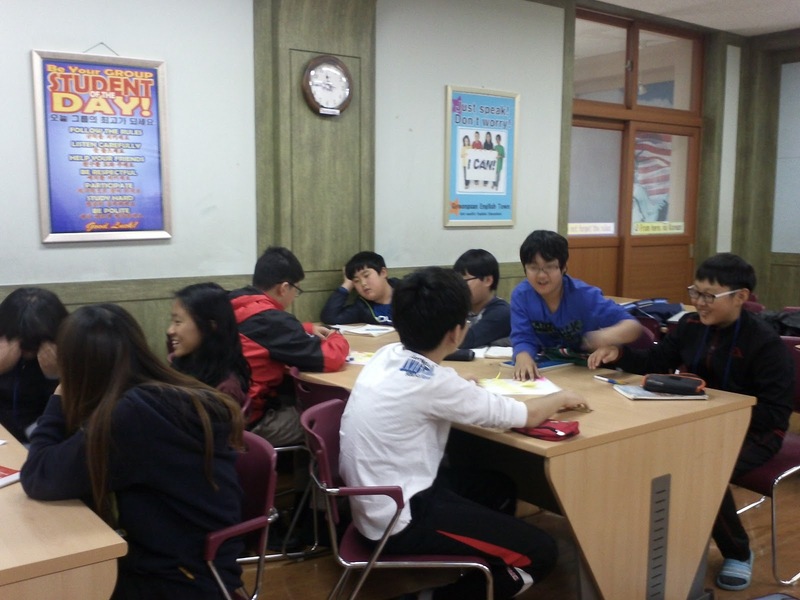 Unlike America where school violence is more defined and easy to see, Korea has to deal with a much more passive type of abuse and bullying. 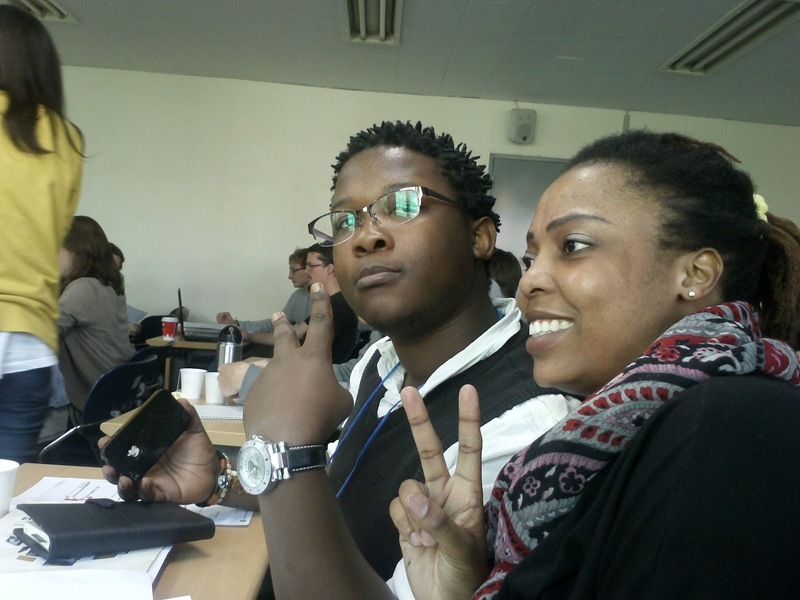 Students are often harassed by their peers quietly and in very silent difficult to identify ways. Sometimes these cases are so severe the students feel like the only way to make it stop is to end their own lives. The suicide rates in Korea are unfortunately very high. It breaks my heart that students can be singled out for stupid, pointless differences and then made miserable. These students all work so hard already to get through school. I find it incredibly sad that instead of working together to make school life more bearable, more often than not students find minute differences and use that as a reason to pick on their peers. In the Korea Times there is a section called Student Corner. I'm always amazed at the things these students of varying ages are think. One letter really struck me it was written by a high school student named Kang Su-jeong (Korea Times Student Corner). She wrote that sometimes she can't understand the level of violence that her peers are capable of, she is a teenager and instead of worrying about makeup or her hair she worries about leaving her house. She thinks about violence in schools and the state of her society. The children of our global society are growing up to fast and it makes me sad. People will tell you life is short and in many instances that is true. We have a limited time on this Earth so what we do is important while we are here and living with regrets is hard. The sad and ugly truth is however, life is also long. You are currently experiencing a very small moment of your time on this Earth. It might feel like this moment will last forever, but it won't. In the blink of an eye you will be looking back on these years of your life. Don't do something that will cause you regret for the rest of your long life. Treat others as you want to be treated because there are some things that can not be undone. Try to find a way to live your short, long life happily. So it's been a month huh? I am really bad at this whole updating thing right? Well to make up for my shameless laziness I have added a random video courtesy of my friend Chi Sun. 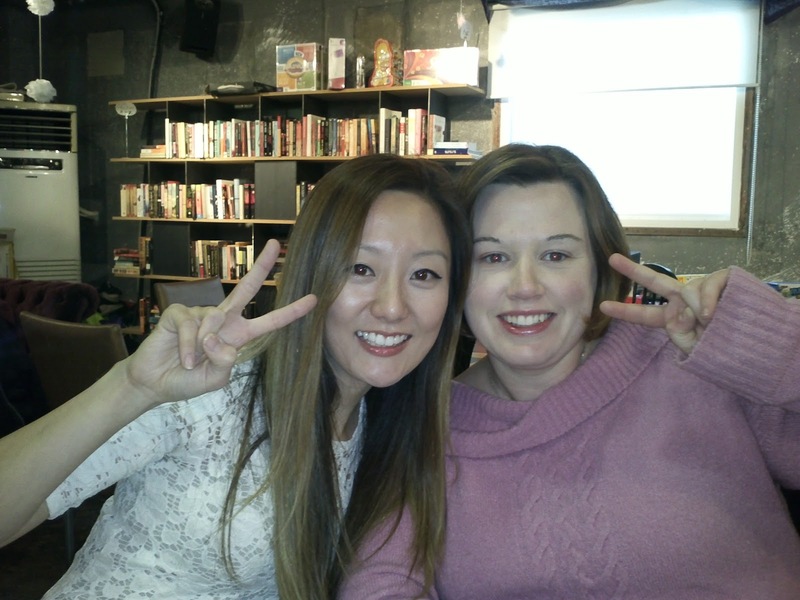 This is from out Thanksgiving escapades in Daegu. My school's gifted program is winding down this next month. As a matter of fact there are only two more Saturdays and then the Saturday classes are over. They come for English camp for 3 weeks in January and then they graduate. All the 6th grade students will be graduating and going on to middle school! I really will miss those kids they've been so much fun. Some of them can choose to come to the middle school gifted program but there is a rule where kids can only do it for two years so I'm not sure how many of them can actually come back. She has like radar when it comes to cameras, I tried to catch her unaware a couple of times but it just wasn't possible! Why so serious? This activity was about what three things you would take with you if you were trapped on a deserted island. These girls were sooooo serious about it. The group behind them was 4 boys who played kai-bai-bo to see what they should pick lol. The classes are all full of very bright students but I must say I do have a particular soft spot for E3 and these boys. They are mischievous but always entertaining. Today was my first day off in quite a while! I've been rather busy but that's making time go by unbelievably fast! It amazes me that November is almost over. 4 months in Korea already, how about that? So many things have been going on but I wanted to post about this weekend first mostly because it was awesome and since this is my blog you're all basically subjected to whatever I decide to ramble on about anyway. 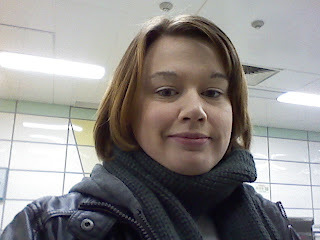 After my classes at Imdang in the morning I ran to hop on the subway (Well actually I kind of stopped for coffee then I ran, what coffffffffeeeeeee, mmmmm). 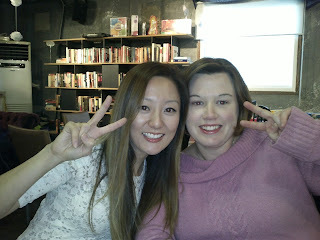 I met up with my friend Kirstin we went shopping in Daegu before our Thanksgiving dinner. At about 4:30 we met up with our friend Chloe and then we all went to dinner together! 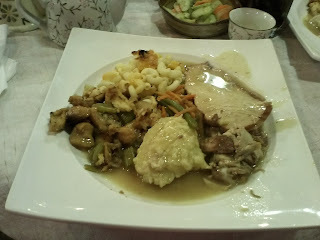 The Thanksgiving dinner at Buy the Book was a little taste of home! We had a really nice Thanksgiving away from home! It was really great to be with friends when family was so far away. We even goofed off and made videos of dinner which I may eventually manage to get from Chloe lol. The owners probably thought we were nuts! We were having fun though so I call it a win! After dinner we ran around for a while then poor Kirstin went home (or rather she returned to quarantine) because she still has a cold and I met some of Chloe's Korean friends. They're really nice guys and they'd all been hiking earlier that day! I'm hoping my ankle heals up soon so I can go back to doing more entertaining activities. Sunday I got up and headed to Beomeo station where I was supposed to meet with a volunteer coordinator and a couple of other volunteers. 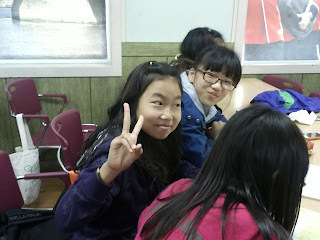 We were going to an orphanage in Daegu! I didn't take any pictures at the orphanage it didn't really seem right and since it was my first time there I was a bit nervous so I really wanted to not do anything that would be considered bad. The boys were hilarious! Very happy to see foreigners and play. Within about 20 minutes of being there one of the little boys decided that the best spot to be was my lap. I kept asking him his name and I knew he understood me but was just being shy so finally I switched over and asked him in Korean and once he stopped staring at me with his mouth open he answered (That's right you will talk to me whether you want to or not!)! We ended up playing with them for most of the afternoon. They really love soccer and baseball. Although two of the smaller boys really wanted to play hide and seek so we ended up playing that and even the coordinator from the government office that had come with us joined in. I was really sad when it was time to leave. I can't wait to go back. Right now it's a once a month thing but I'm hoping to volunteer more. What really struck me is that the kids seem really happy and close with each other which is great. 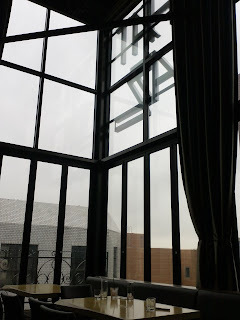 The building was really nice but I've heard that kids from orphanages unfortunately don't often get the opportunity to experience higher education. I'd like to hope that's not true as most of these boys were very bright. After volunteering I went to downtown and met with Rachel! It'd been way too long! We visited and had dinner. All told it was a fantastic weekend! Sooooooo I realize I've been really behind in keeping people up to date on things that are going on in my life in Korea. That's mostly because I have been insanely busy right now... with just a touch of lazy... 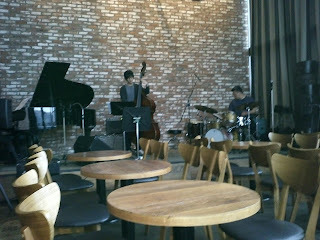 I had said that I was going to put up some videos I took of some Jazz in Korea. Since these videos I went back to All That Jazz when I was in Seoul last weekend but they had a new age Jazz band playing that I really wasn't digging at all. So here's hoping next time I'm up in Seoul a better band is entertaining. 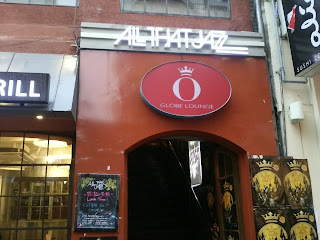 Then again there are also 4 other Jazz clubs in the Seoul area that I could hunt for. 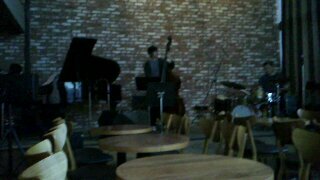 Recently I was told by one of my really awesome coworkers about a Jazz club in Daegu that I could go to. If that's the case I'd be able to hit up a live music venue much closer to home but that might have to be a endeavor for next weekend or something. Once again this is All That Jazz it's tucked away on a side street in Itewon on the Third floor. This is the band that was playing it was a three man (well 2 guys and a girl) band. The gigantic windows definitely set the mood in this rustic studio looking space. At night they pull the giant curtains closed to keep the mood inviting (The giant lit neon signs kind of take away from the mood). Yes that's right I really am alive I promise! I have a lot to catch you all up on. Been trying to catch up on the work front as things have just been incredibly hectic. The school semester finishes up the end of December so that's one of the reasons everyone has been so busy. A lot has happened in the last couple of weeks! 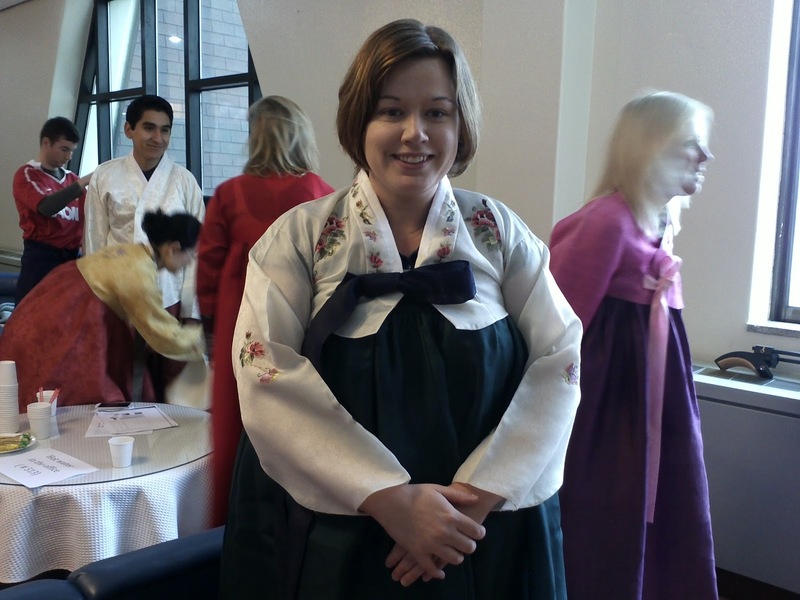 I went to Seoul for a week long training program for one thing! It's shocking that I managed to make it back on my own right? My sense of direction never was very good as many of my friends can attest to from 1st hand experience! Surprisingly it was rather easy to navigate around Seoul and I didn't get lost. The subway system is massive and often a bit intimidating but actually it's rather easy to navigate as long as you take your time and are careful. 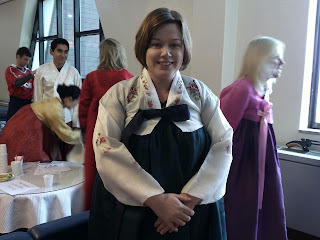 At the training I got the chance to wear a Hanbok or traditional Korean clothing. 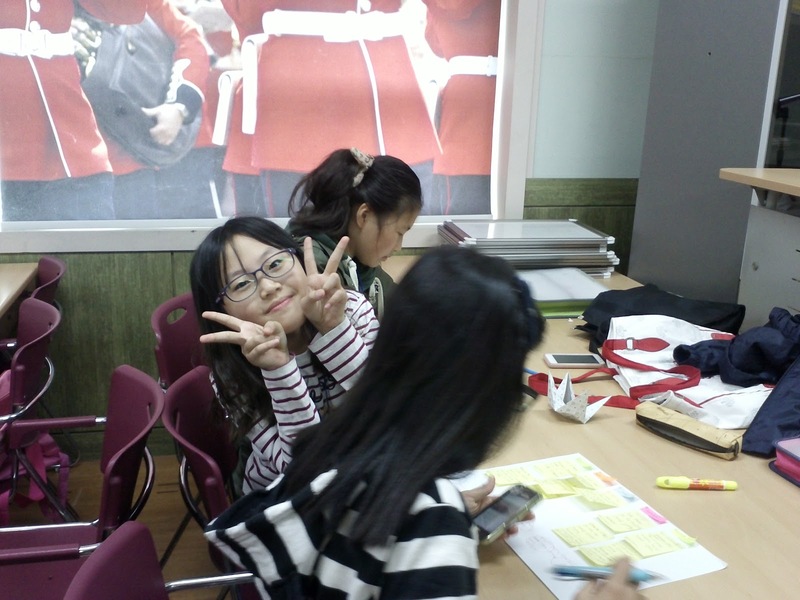 It was interesting to listen to them talk about culture in Korea. One of the few classes I really enjoyed there. 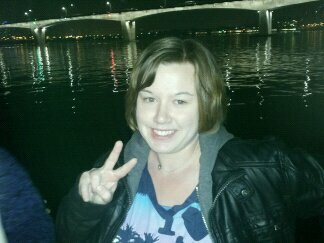 We took a boat tour of the Han River which was beautiful at night! 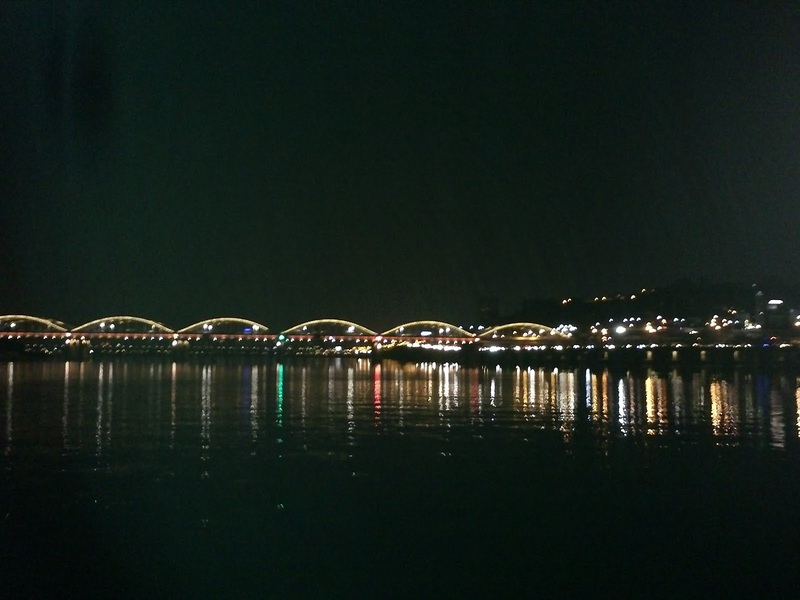 The bridge over the water puts on a light show every night! It was unreal to watch! 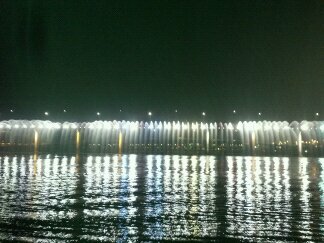 The lights on the water were amazing. I really loved the Han River! I'd love the chance to go back and explore it during the day. It's me! I was having fun but I was freezing! 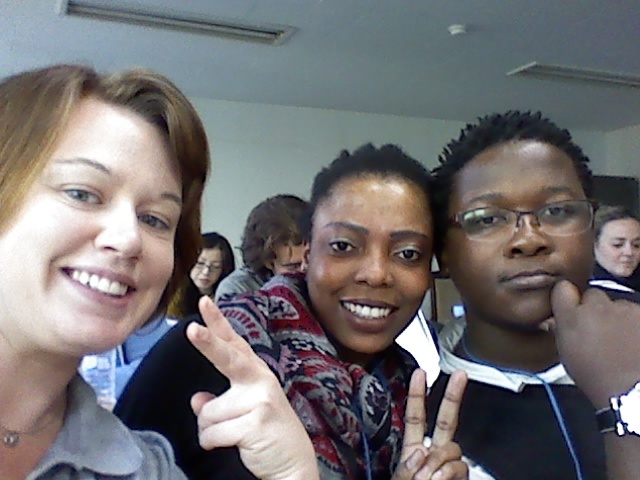 Nyameko and Sindi were a couple of awesome people I met during the week! They're both from South Africa and both teach in the same province as me. All That Jazz is a jazz club I managed to visit in Seoul on my last day! It is a fantastic club that often has live jazz bands in Seoul play. I enjoyed live music and some of the best food I'd had in Seoul the whole week I was there. 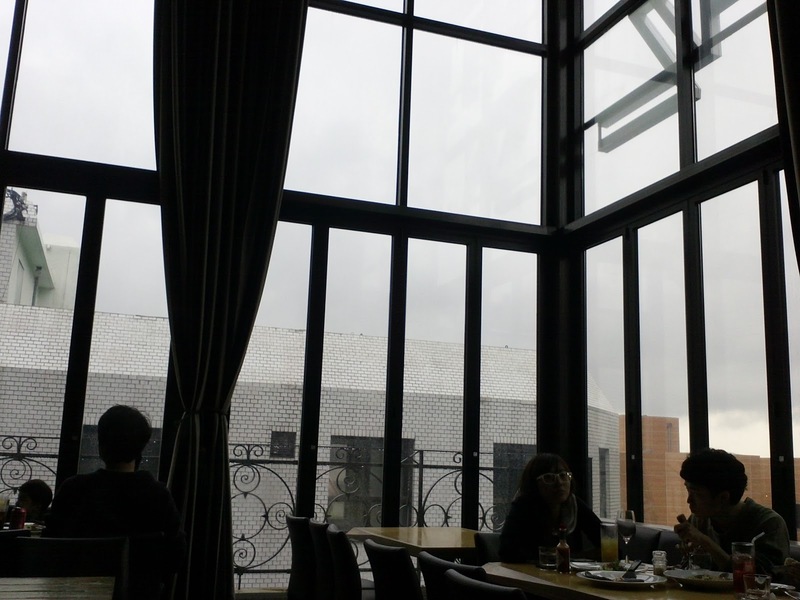 The club is on the top floor so you look out some huge two story windows at a rather beautiful Seoul cityscape. The roof does leak in a few places though but I suppose it adds to the charm right? 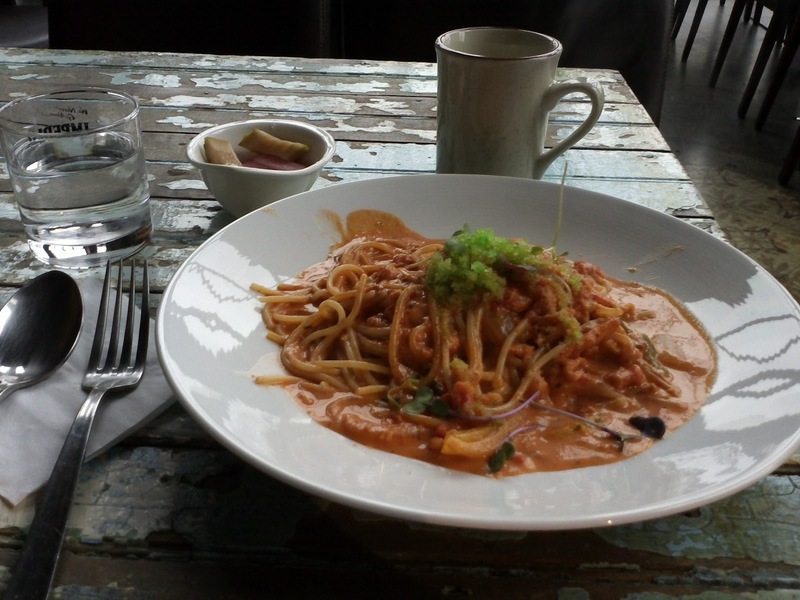 Some truly delicious rose crab pasta! All told I didn't get to do much while in Seoul but I did meet a few really cool people, listened to some great jazz and found a truly fantastic English bookstore so I definitely would declare the week a success! 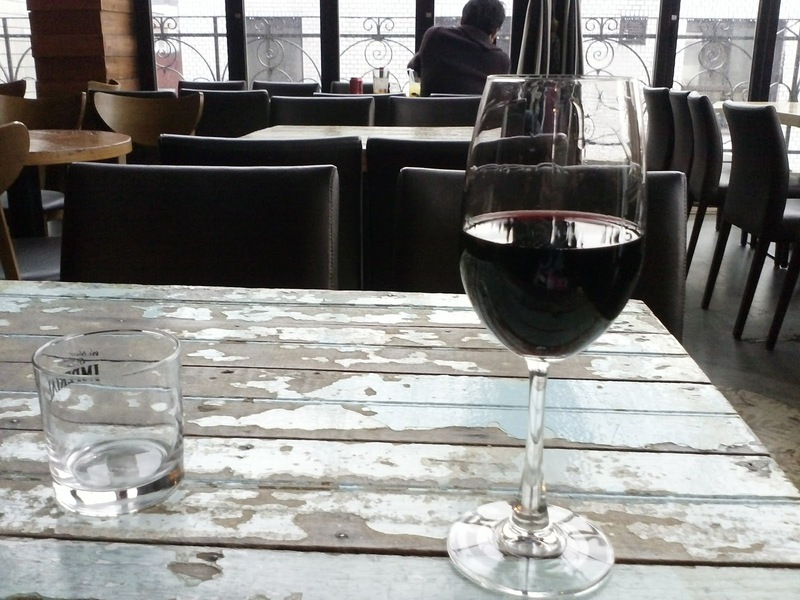 Seoul has a really unique feel to it that I found myself enjoying. I really can't wait to head back up there! This time of year in Korea is lovely really. As the weather has cooled down people are out and about trying to make the most of their free time before weather gets terrible. I've been warned multiple times that the winters in Korea will be very cold. 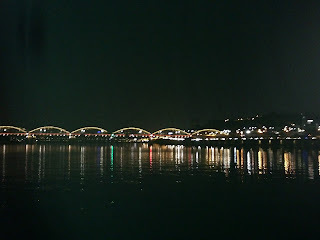 So with that thought in mind after teaching Saturday morning I hoped on a train to head off for Jinju where the annual lantern festival was being held last weekend. The festival was voted the best in Korea for 4 years in a row until 2009 when it was canceled because of an outbreak of the flu. Across the way is a rustic castle of sorts that is incredibly amazing to walk through. It was open to the public so after securing a place to stay I hiked across the bridge to explore before it got dark and they lit the lanterns. Walked through the giant entry way into the main courtyard. 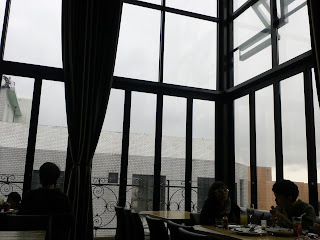 The place was huge! After walking through the giant entryway you walk across the courtyard and then through a very congested much smaller doorway. These lanterns were massive in size and a lot of them were moving which was beyond amazing! On of my personal favorites! This and the dragon lantern! 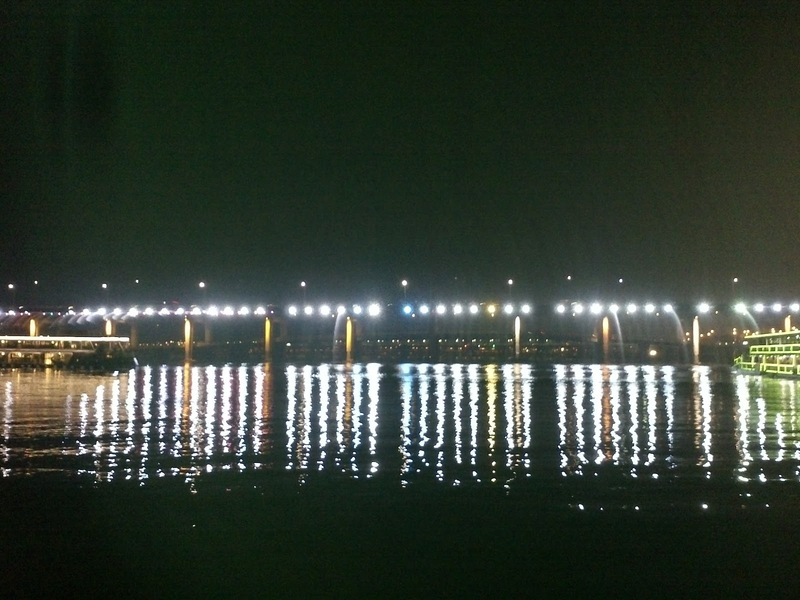 The bridge all lit up! This side of the bridge had a bunch of lotus flower lanterns. All in all I really enjoyed Jinju but I really felt like the Andong mask festival was more impressive to see. It had more activity and the location wasn't as congested. 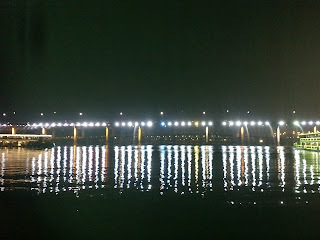 The lantern festival at Jinju is definitely however, something that is worth seeing if you are in Korea in October. Well it's past my bed time so I'm off have a lovely night world. My name is Cara and I'm from a little agricultural town. I went to Central Washington University and obtained a B.A. in Asian Studies. Eventually I would love to work at a University teaching International students English.